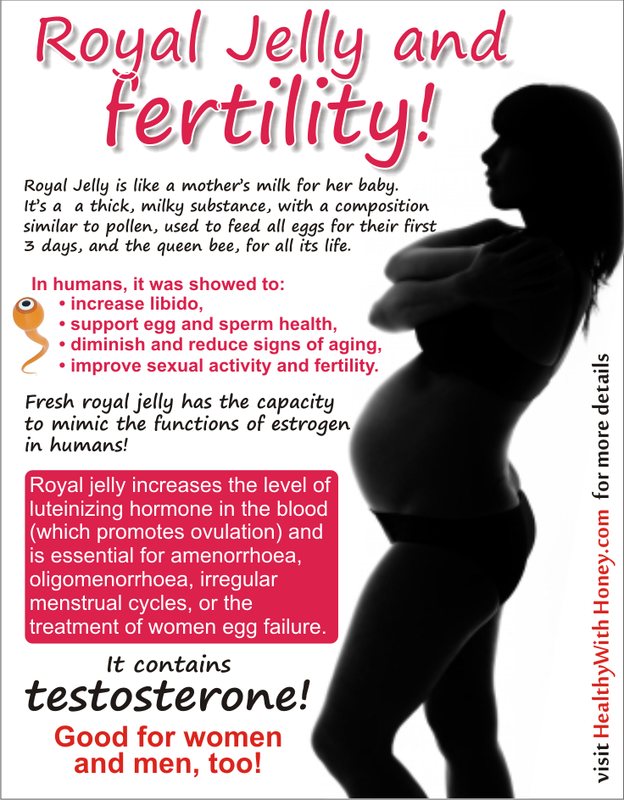 It is possible to develop some bad symptoms if you take royal jelly, though some posts might tell you different. There are people who are allergic to royal jelly, the only problem is that we don’t know if we belong to that category or not. We’ll see here who are the people at risks and what can we do to prevent it. The allergic reactions could be generated by the basic composition of royal jelly (mainly 2 main proteins), but can also be triggered by grains of pollen present in royal jelly harvested from certain plants that people are allergic to, or by some emulsifiers used in capsules. Due to royal jelly consumption, there have been reported cases of anaphylaxis, bronchospasms and asthma. Other symptoms included: contact dermatitis, low blood pressure or gastrointestinal issues. When should we worry that we may be allergic to royal jelly? 1. 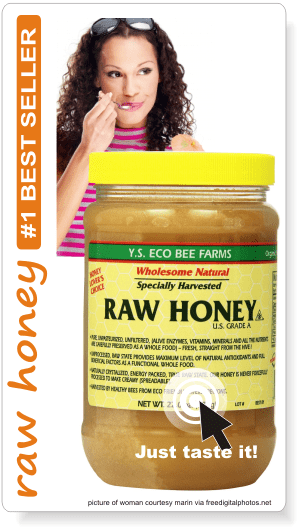 If you have bee or pollen allergy, you may be allergic to royal jelly supplements as well. The study Asthma and anaphylaxis induced by royal jelly, by Thien FC et al. from the Department of Respiratory Medicine, Alfred Hospital, Prahran, Australia, tried to elucidate if asthma and anaphylaxis shown in 7 patients after ingesting RJ, were of an allergic nature (IgE-mediated) and tried to identify allergenic components of royal jelly. The study proved that these reactions were indeed IgE-mediated hypersensitivity reactions and there were 18 different IgE-binding components detected on blots following electrophoretic separation of royal jelly under dissociating conditions. 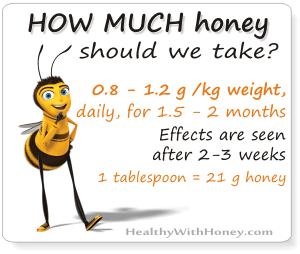 If I am allergic to bee venom will I obligatory be allergic to royal jelly as well? No. In the above study 63 sera from subjects allergic to bee venom were examined and the results showed no direct relationship between IgE antibody reactivity to bee venom allergens and to royal jelly proteins, although 38% of the sera reacted with a royal jelly solid phase. 2. 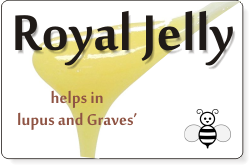 If you have a higher allergic sensitivity you may be allergic to royal jelly! • The same mentioned study showed that the IgE antibody reactivity to royal jelly proteins was detected in 52% of 75 subjects with allergies to inhalant and/or food allergens. • A 7 yo child developed allergic symptoms after consuming royal jelly, but later on it was proved that the child had no allergy to royal jelly itself, but to some almond grains of pollen found in it, to which the child had an already confirmed allergy. 3. If you have asthma you may be allergic to royal jelly! • In 1995, Independent.co.uk was publishing a post about a 31-year-old Brighton woman who took capsules of royal jelly and collapsed after an asthma attack. She needed intensive care for what doctors described as life-threatening respiratory distress. • The study Case of anaphylaxis caused by ingestion of royal jelly, presented the case of a Japanese woman with a history of bronchial asthma, allergic rhinitis, allergic conjunctivitis, atopic dermatitis and food allergy, who developed anaphylaxis after drinking a beverage of crude royal jelly. After allergenic tests were done, royal jelly was chowed to be the component that triggered anaphylaxis. • A 43 yo Chinese woman developed occupational asthma triggered by aerosolized royal jelly (She was working at a royal jelly processing factory). From those 7 patients, a 26 yo female with asthma since the age of 2 took 2 naturopathic royal jelly/ginseng capsules, in order to treat an upper respiratory tract infection. Within 11/2 hours, she had a rapidly progressive attack of asthma with her peak expiratory flow rate dropping from 400 to 80 L/min. At hospital she received nebulized bronchodilators and intravenous steroids and completely recovered after 24 hours. • Similar cases have been documented in Australia. One report recounted how five asthmatics had suffered adverse reactions. A 34-year-old woman stopped breathing and had to be ventilated. • A 2015 study conducted by El-Aidy WK et al, on mice, showed the effects of honey, royal jelly and propolis on asthma-induced mice. From all three bee products only propolis exhibited considerable ameliorative effects against asthma. The mice treated with honey, and the ones treated with royal jelly exhibited an increased incidence of asthma cascade events due to increased inflammatory cells. 4. 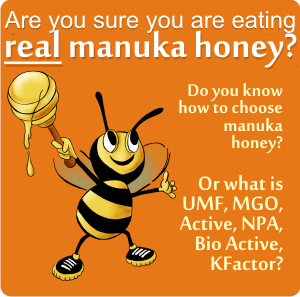 You can be allergic to royal jelly even if you are not allergic to anything else. • A 33-year-old Japanese male developed severe facial pruritus and erythema, followed by vertigo, numbness in his fingers, generalized pruritus, wheals, dyspnea, wheezing and impaired consciousness. He was treated with corticosteroid and fluid therapy, and his symptoms subsided. Upon allergy testing, his only positive reaction was to royal jelly. • The most serious case was reported in Australia of an 11-year-old girl who died of what was diagnosed as an asthma attack. When she took a double dose of royal jelly she developed a wheeze and severe diarrhoea, started having bronchial spasms, and was taken to hospital. 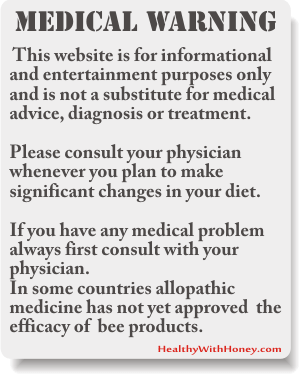 • Other five cases of royal jelly-induced asthma and anaphylaxis. 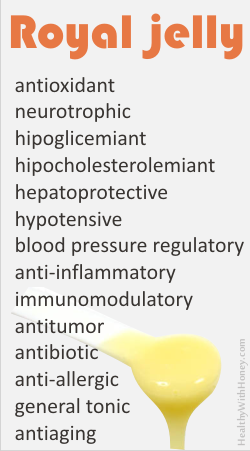 Which are the allergens in royal jelly? According to the study Characterization of major allergens of royal jelly Apis mellifera, by Rosmilah M et al, from the Allergy and Immunology Research Centre, Kuala Lumpur, Malaysia, the major allergens of royal jelly are the major royal jelly protein 1 (MRJ1) and major royal jelly protein 2 (MRJ2). All literature agrees that they are extremely rare. As long as you don’t belong to any of the categories from above, there are no other side effects. With one recommendation: START WITH SMALL AMOUNTS and increase them to the desired dose. The very few people who experienced side-effects symptoms after ingesting RJ reported: eczema, rash, cough, light headedness, gastrointestinal issues, increased heart rate, stomach, distress, nausea. But all these go away once the dosage is cut out. Nevertheless, it is possible to experience a fast cleaning soon after starting your treatment. It’s a physiological reaction of the organism, which will pass. Among the symptoms: headache, a general achy feeling, rashes and even loose bowels. If you are an atopic person (have a higher allergic sensitivity), have a history of asthma or have bee and pollen allergy – you have all the chances to be allergic to royal jelly. Take an allergy test before. 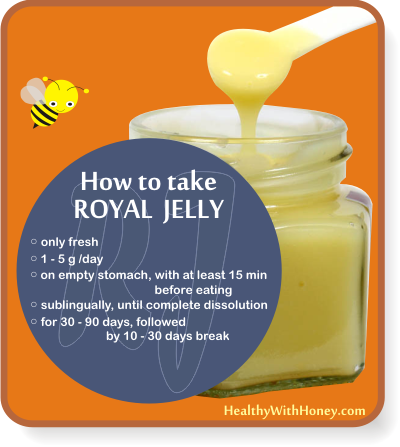 Always start with small amounts of royal jelly and increase to the desired dose in time. Thien FCK, Leung R, Plomley R, Weirier J, Czarny D. Royal jelly-induced asthma [Letter]. Med J Aust 1993;159:639. 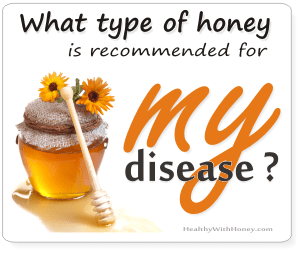 Royal jelly is an efficient natural treatment for diabetes type 2 What is sourwood honey? I have a facial product made from royal jelly that I love but the truth is it’s hard on our already struggling bee population to use royal jelly. What to do? We need the bees to prosper.